Lions and tigers in traveling circuses often suffer in silent agony for years due to broken and infected teeth. A blow to the face of a lion during training or when the animal is being moved, can leave a lion with broken and infected teeth and a lifetime of pain. Animal Defenders International (ADI) is engaged in an operation with the Peruvian authorities, SERFOR, to end the use of wild animals in traveling circuses. There are now 21 lions removed from circuses in the ADI Operation Spirit of Freedom rescue center just outside Lima and a significant number of the lions have traumatic injuries to their teeth. This week Dr Peter Emily, regarded by many as the inventor of veterinary dentistry, flew in from the USA with a team from the Peter Emily Foundation to perform dental surgery on two of the most urgent cases. Damage which, left unattended, had the potential to be lethal. Simba, a lion saved from a circus in Ayacucho, suffered with a large canine tooth with its top smashed off. The damaged tooth had become infected and split. Simba was anaesthetised and carried on a stretcher to the field operating theatre in the rescue center. Dr Emily salvaged the tooth by cutting more off and then building a custom brace to bind the remaining tooth together, saving the tooth. 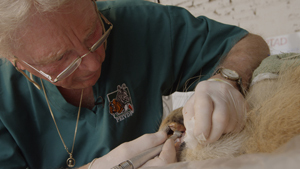 The lion’s other damaged teeth were also cleaned out and repaired. Junior, the oldest lion in the ADI rescue center at 17 years old, had massive infected dental damage. When pus had erupted through the old lion’s cheek, the ADI veterinary team called in Dr Emily. The dentist reviewed the images sent by the ADI vets and decided he should operate with some urgency. Dr Emily made the most urgent repairs, during procedures that lasted over an hour, but says he will have to undertake further surgery to completely repair the damage to Junior’s teeth. A group of Lima veterinary students who are volunteering in the ADI Spirit of Freedom Rescue Center were able to work with the ADI veterinarians monitoring and keeping the lions stable during surgery and saw close-up, the world’s best veterinary dentists at work. The lions recovered rapidly from the procedures and were soon roaring again in the afternoon. Tomorrow the team will be assessing 22 monkeys at the center, also rescued during ADI’s Operation Spirit of Freedom. In the coming weeks almost 60 animals rescued during ADI’s Operation Spirit of Freedom will be relocated to permanent homes – with ADI currently engaged in building habitats in the Amazon forest for rescued native wildlife. The 21 lions from Peruvian circuses will be joined by 9 lions from Colombian circuses on the Spirit of Freedom Flight to huge enclosures in a sanctuary in Colorado. Dr Emily will be performing dental surgery on most of the lions once they reach their new home and will resume work on Junior’s teeth. Having rescued the animals, ADI is seeking funds for this huge relocation mission ­ the biggest of its kind ever undertaken. Peru’s ban on wild animals in circuses was passed in 2012 following a successful campaign by ADI and local animal protection groups, following a two-year undercover investigation by ADI which revealed widespread suffering of circus animals across South America. The shocking exposé led to calls for action and nationwide bans followed in Bolivia, Colombia, Peru, Ecuador and El Salvador. Operation Spirit of Freedom was launched in August 2014 with ADI providing complete logistical support to the Peruvian authorities and raiding circuses all over Peru. 21 ex-circus lions are now in ADI’s care in the temporary ADI Spirit of Freedom rescue center near Lima. ADI has also begun assisting the Colombian authorities and has in ADI care nine circus lions which will join the Peruvian lions on the flight to the USA. Legendary, award-winning TV host Bob Barker donated $500,000 to get the rescue mission underway and establish the temporary holding center in Peru. ADI estimate that construction of all the habitats for the indigenous wildlife, their care whilst they are constructed, and the cost to relocate the animals, will require $60-80,000 – and possibly more because of the diversity of specie. Approximately $200,000 is needed for the relocation of the lions from Peru and Colombia.